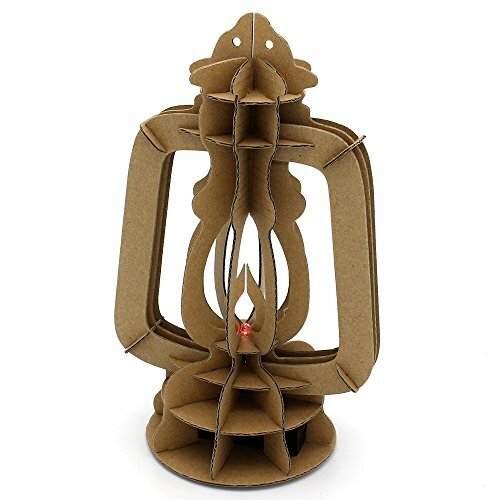 Cardboard might seem like an odd material for a lamp,considering cardboard and extreme heat are never a good combination. Yet we have made it work,creating lamps that are light,inexpensive,and less wasteful than traditional versions. Cardboard design has popped up quite a bit recently,in everything from chairs to architecture. Lamps are a less intuitive match (the whole "highly flammable" thing),but here we show that cardboard and flame can work together. We believe in homes that are a perfect reflection of the people who live inside. DIY a cardboard lantern might be a great way to add a unique, unexpected touch in you room. It's light, it's sturdy and it's flat-pack.Why not to love? ECO-CONSCIOUS:Made from 100% recycled cardboard,a non-toxic,environmentally friendly material. SPARK THE IMAGINATION OF CHILDREN:spray paint,water color,gems,glitter,newspaper or sequins all these craft material will make you and your kid in a mood for a fun cardboard craft project! PRE-CUT PIECES & FLAT PACKED:Each product is meticulously developed on the computer and precisely cut,assembly using slotted construction.Makes for easy shipping,with easy to follow step-by-step instructions. THINK OUTSIDE THE BOX:Instead of using cardboard as constructive material,we transform it into objects range from pop-out toys,home decor sculptures,storage projects,furnitures which are imaginative and eco-friendly,reversing in this way its meaning and significance in modern art practices. If you have any questions about this product by I'm Charmer, contact us by completing and submitting the form below. If you are looking for a specif part number, please include it with your message.